This brochure shows model homes that were being built in the Oak Ridge II community of Pine Castle, Florida. The brochure features five ranch model homes and includes prices and available interest rates. Florida Ranch Lands, Inc. is a real estate development firm founded by Craig Linton in the early 1960s. Linton's firm was best known for brokering the land deal that brought the Walt Disney Company to its present location. This brochure was also co-opted by Florida Gas Utilities Company. Original 13-page brochure: Collection of the Pine Castle Historical Society, Pine Castle, Florida. Digital reproduction of original 13-page brochure. Originally created by Florida Ranch Lands, Inc.
Jack. "Florida Ranch Lands Gets A New Beginning.'" The Orlando Sentinel, April 25, 1994. http://articles.orlandosentinel.com/1994-04-25/business/9404250529_1_linton-florida-ranch-commercial-acreage. 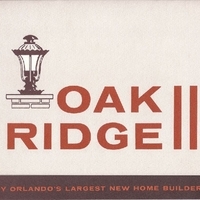 “Oak Ridge II By Orlando's Largest New Home Builders.” RICHES of Central Florida accessed April 24, 2019, https://richesmi.cah.ucf.edu/omeka/items/show/7011.